The Beacon AV and KVM extenders are manufactured to a high standard, providing the user with a high quality image extender of distances up to 300 metres (1,000 feet). The use of extenders allows you to place your monitors anywhere you want. By using CAT5 cable, the installation of long distances is very simple and economical. Your main computer or media player does not need to be with your screen and can be located in a secure enviroment. One transmitter can extend out to multiple receivers, allowing you to play the same content on multiple screens. The Beacon CAT5 UTP KVM Switch system offers flexible, high-quality control of multiple PCs or servers from a single keyboard/monitor/mouse station. With the Beacon proprietary video enhancement technology, servers can be up to 300 metres (1,000 feet) from the console. Since Beacon KVM switches and extenders are compatible with other brands of KVM switches, it makes an excellent KVM Console extender for existing configurations. With Beacon's CAT5 AV Solution you can broadcast a single video screen, with sound, to multiple remote monitors at distances up to 300 metres (1000ft) away. The system includes a central control unit at the broadcast source, and a choice of remote units for the remote monitor locations. Each remote unit is connected via a single, easily installed CAT5 cable, reducing cable clutter. The new range of Beacon products includes IP solutions. The Beacon AVK-950 is a perfect solution to extend high resolution HDMI/DVI, USB, IR and RS-232 over IP Ethernet. It includes AV-950T transmitter and AV-950R Receiver. The AV-950T transmitter connects with PC or any device with HDMI/DVI source. The AV-950R receiver connects to HDMI/DVI display, speaker, microphone, USB (Keyboard/Mouse/Storage/ …) and RS232 devices. 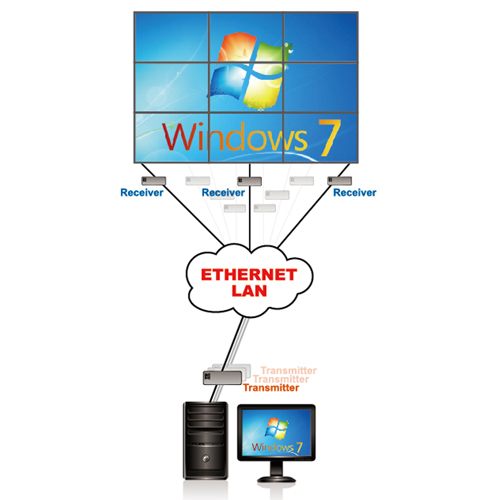 It is based on the standard Ethernet Internet Protocol, so all of Giga or Fiber Ethernet LAN switching HUB can be used to inter-connect the Transmitter and Receiver for the high definition HDMI/DVI and KVM extension applications, like informational displays, entertainment, boardrooms, courtrooms, medical, military, education and digital signage. HDMI/DVI Video-Wall over IP Ethernet. The AV-950W is a perfect solution for HDMI/DVI Video-Wall over IP Ethernet. It includes AV-950WT Transmitters and AV-951WR Receivers. The AV-950WT Transmitters connect to PC or Blue-ray player for the HDMI/DVI input source. The AV-951WR Receivers connect to HDMI/DVI video-wall displays and audio devices. The communication protocol between the units is Internet Protocol (IP) based, any Gigabit or Fiber Optical Ethernet switch can be used for the Transmitter/Receiver inter-connection. That means the HDMI/DVI video input source can be located away from the video-wall displays but within the local network. The system provides high flexibility for expansion. A Transmitter is required for each row of displays and a Receiver unit is required for each individual display. It is very easy and flexible to expand your video-wall from 2 x 2 to 3 x 3 and … up to 8 x 8 by adding transmitter and receiver units. Razor sharp video, plus high fidelity stereo audio. Resolution up to 1920 x 1200 @ 60Hz. Extends RS-232 signals to remote RS-232 compliant device. It is perfect for digital signage applications to turn screens on and off, volume control etc.. Receivers have Gain and EQ adjustments for optimum image quality. Use a single UTP cable to 100/300 metres (model dependent) from Transmitter to Receiver. Supports the latest TFT, LCD, SVGA, VGA multisync monitors and DDC2B high resolution. 300 Metre models include RGB skew adjustment. Daisy chainable Receiver/Repeater boosts signal and retransmits to downstream displays. Supplies crisp video VGA from a source up to 300 Metres (1000 feet) away. Total hardware solution. OS independent. Adjust video EQ, Gain and RGB skew for optimum image over longer cable runs. Easily distributes one source up to 8 displays simultaneously. Extends high resolution VGA and high fidelity stereo digital audio to remote displays. Supports resolutions up to 1920x1200 @ 60Hz. The VGA out port of the transmitter is designed for connecting a local monitor or for cascading other transmitter units to increase the number of supported displays. Transmitter requires no separate power supply. Attach transmitter directly to notebook or PC VGA output. Connect receiver to video projector. Receive is adjustable for video Gain and EQ, to optimise image for your particular distance. 6V power adapter included with kit. Sends RS-232 data at 230 kbps up to 1000M (3300 ft). Pure hardware solution - real time data transfer, no software conflicts. External powe adapter DC5V required. Transfer data or files beteen PCs or other equipment. Isolation voltage up to 4000V. Adopt photoelectric isolation to prevent device damaged by ground 100p and surge. Audio and video are transmitted digitally over the CAT-6 cable for zero signal loss. Supports resolutions up to 1080p and 1920x1200. Sends video at distances of up to 75M (220feet) at 1080i and 50M (150feet) at 1080p. Fully compliant with HDMI 1.3/HDCP specification. Built in Boost/EQ to adjust the video quality. Audio and video are transmitted digitally over one CAT 5/6 cable for zero signal loss. Suitable for all HD resolutions including 480p, 720p, 1080i and 1080p. Support bandwidth up to 10.2GHz. Easy installation without any software or driver installation. HDMI is backward compatible with DVI. The system works with either DVI or HDMI input. (For DVI connection, you may need a HDMI to DVI adapter). Audio and video are transmitted digitally over one CAT6 cable for zero signal loss. Supports max. resolutions up to 1080p, 2K and 1920x1440. Daisy-chaining multiple AV-822TC, the HDMI signals can be extended up to 250 Metres (820 ft). Supports one HDMI input with 4 x RJ-45 outputs. Support HD video 1080p and PC WUXGA (1920 x 1200) resolution. Based on Internet Protocol, all standard Giga or Fiber LAN switch HUB and CAT 6/7 cables can be used for inter-connection. Easy cabling, easily install, and easily maintain. For the digital signage application, support one-to-one and one-to-many modes with no signal delay. Support 4 x USB over IP devices for the KVM extension, you can attach keyboard, mouse, storage, speaker, microphone at the AV-950R receiver site to control the PC at the AV-900T transmitter site. Built-in USB sound card, you can directly connect speaker and microphone on the AV-950R Receiver. Support IR bridge, you can use the IR remote controller at AV-950R Receiver site to control the set-top box at the AV-950T transmitter site. Support RS232 bridge, DTE/DCE are built-in on both sites. Pure hardware design, plug-and-play, no additional software installation is required. Support HD video 1080p and PC 1920 x 1080 @ 60Hz resolution. Based on standard Internet Protocol, any Gigabit or Fiber Optical Ethernet switch can be used for inter-connection. Easy cabling, easy installation and easy maintenance. The HDMI/DVI video input source can be remote from the video-wall displays anywhere within the local network. Cost effective, with high flexibility for expansion. Simple to move from 2 x 2 to 3 x 3 and up to 8 x 8. Integrated support with the IR/USB bridge extension. You can use the IR remote controller or USB keyboard/mouse at the Receiver site to control the Blue-ray player or PC at the source site. Plug-and-play setup and an embedded Management Control Web-Page in the transmitter unit. Simply use Web Browser to manage video-wall settings and operation. Attach the VGA/DVI and audio to the Transmitter, it starts to encode audio/visual to the Ethernet based IP packets. Attached the Receiver to the monitor and speaker, it starts to decode the IP packets to the audio/visual signals. Supports one Transmitter and multiple Receivers. There is no delay between each receiver. Supports multiple Transmitters and Multiple Receivers for grouping broadcast if the switching HUB has the IGMP function. Built in source selection button on the AV-900R receiver and convenient On Screen Display menu for selecting KV-900T transmitters. Support IR bridge function, you can use the IR remote control at AV-900R site control the set-top box at the KV-900T site. An optional web-based manager software (AV-900S) can be installed on any Windows PC to manage all the Transmitters and Receivers. Support HD video and stereo audio. Pure hardware design, plug and play, no additional software installation is required. Extends high resolution video and high fidelity stereo up to 300M (1000 feet). Supports HDTV resolutions of 480p, 720p and 1080o with no loss of quality in the component video signal. Pure hardware plug n play design. Supports Stereo Analog or Digital Audio input. Composite Video and Audio Balun kits to extend up to 600 metres (3000 feet). For 300M (1000 feet) installations, use 2 x Passive Transceiver (AV-302) in pairs. This will allow a composite video signal to be transmitted via a CAT5 unshielded twisted pair (UTP) cable up to 300m (1000 ft) in a point-to-point connection. For 600M (2000 feet) installations, use 1 x Passive Transceiver (AV-302) and 1 x Active Receiver (AV-301) in pairs. This will allow a composite video signal to be transmitted via a signle CAT5 unshielded twisted pair (UTP) cable up to 600m (2000 ft) in a point-to-point connection. 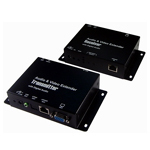 Extend one High Definition Component Video (YPbPr) and stereo audio to 4 or 8 remote displays. 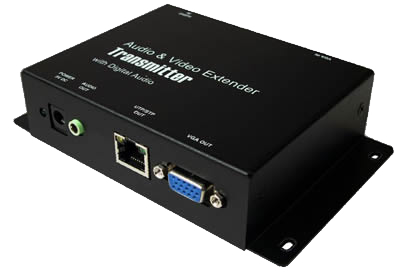 Extend three Standard Definition Composite video and one stereo audio to 4 or 8 remote displays. Supports HDTV resolutions of 480p, 720 and 1080i. Supports multi-user access and control of many computers/server. Convenient PC/Server selection via Hotkeys and intuitive On-Screen Display menus. Supports ISD menu to manage all user accounts by passwords and 3-level access priority (Administrator, Power User, Normal User). Supports full HD 1080p and stereo audio. Cat5 or higher cable to connect the Transmitter and Receiver Units up to 300M (1000ft) apart. 4/8 x Console operation - Control your PC from up to 4/8 Console Receivers by USB Keyboard, mouse and monitor. Supports high resolution video up to 1600x1200 @60Hz. Supports VGA, SVGA and Multisync monitors - console receiver monitor supports DDC2B. Console receiver has video Gain and EQ adjustments for optimum image. The BE-6304M-300 adds RGB skew adjustment for 300M (1000ft) extra long cable runs. Single Console operation - Control your PC from Console Receivers by USB Keyboard, mouse and monitor. High resolution video up to 1600x1200 @60Hz. K30460PS-30 adds RGB skew adjustment for 300M (1000ft) extra long cable runs. Dual Console operation - Control your PC from both the local and Console Receivers by PS2 Keyboard, mouse and monitor. K305632-30 adds RGB skew adjustment for 300M (1000ft) extra long cable runs. By cascading a second level BE-616P units, up to 256 computes can be controlled. Supports DDC-2 protocol and DDC=CI auto screen adjustment. Totally flexible. Handles both USB and PS2 servers. Supports local console and remote access, for convenient control. Flexibility multiplied. Remote Console can be either USB or PS2 style, or both. Simple On-Screen Display makes servers easy to access and control. Add a server at any time without interrupting other servers' operation. Built in firmware upgrade for future proofing.